Whenever one of your teeth has become damaged due to decay or injury, the structure needs to be repaired in order to restore it both functionally and aesthetically. Previously, this would call for an amalgam filling. It did a decent job of restoring your tooth, but it dramatically affected the look of your smile. Plus, over time, amalgam fillings can actually leave a tooth in a weakened state. Whenever we repair one of your teeth at Chaska Dental Center, we want it not only to be strong and reliable but beautiful as well! This is why we always recommend tooth-colored fillings. Rather than using various metals (including mercury), tooth-colored fillings utilize a composite resin to repair the teeth. This is composed of a plastic mixture held together by microscopic glass particles. 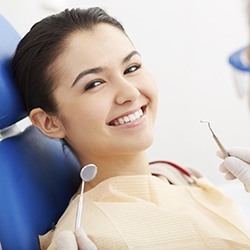 Tooth-colored fillings have a number of benefits over traditional amalgam fillings. Firstly, as the name implies, tooth-colored fillings are specially colored to match the rest of your smile. This means that your tooth will look natural and attractive once we have restored it as opposed to being tarnished with unsightly amalgam fillings. 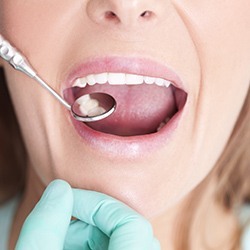 Tooth-colored fillings can repair your teeth better as well. Amalgam fillings do not actually bond to your tooth enamel. To place one, your dentist needed to create a pocket in your tooth for it to sit in, meaning more of your tooth had to be removed. This would make the tooth more susceptible to breakage in the future. The composite resin used in tooth-colored fillings, on the other hand, firmly bonds to your teeth, allowing Dr. Meschke and Dr. Swingdorf to more precisely and conservatively remove the damaged part of your tooth and keep most of it intact. The end result is that you have a stronger, longer-lasting restoration that no one will be able to notice when you smile. When you come in to get a tooth-colored filling, the first step is that you will receive local anesthesia in the area that will be treated. Then, one of the doctors will carefully remove the damaged part of your tooth. They will then apply the resin, which will be in a soft and malleable form. Once the resin has been sculpted to give your tooth the support and look it needs, a special light will be used to harden it quickly. The entire process usually takes less than an hour, and patients typically can go about their day normally afterward. Tooth-colored fillings are extremely durable and will last many years with proper dental care. Often, when fillings fail, it is because the remaining tooth has started to decay again, so be sure to brush and floss regularly once you have gotten a filling. If you want to know more about how we can consistently and flawlessly repair your teeth with tooth-colored fillings, please give us a call today. You can get the best of both worlds when it comes to strength and beauty at Chaska Dental Center, so don’t wait.